Want a quick free 1,500 Marriott Rewards points? Or if it’s more your style, how about a free 500 SPG Starpoints (since you can transfer between the two programs)? All you have to do is connect three of your social media profiles to your Marriott Rewards account. You can earn 500 Marriott Rewards points each for connecting your Facebook, Twitter, & Instagram accounts. Note that you do have to give certain permissions for the connections, and some people might not be comfortable with doing so. That said, the points seem to post almost instantly, so you don’t have to keep the connection forever. 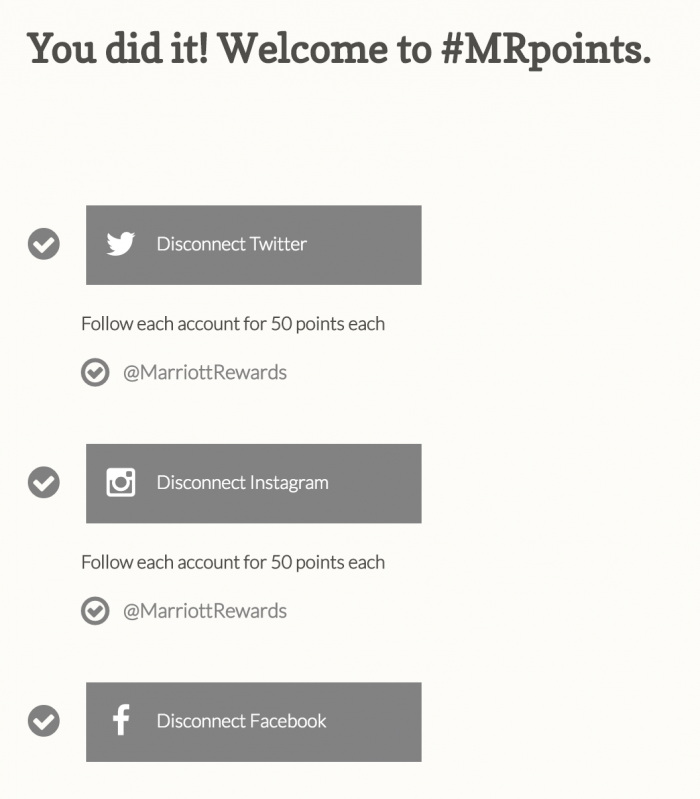 The terms & conditions do outline that “Marriott Rewards members who register and perform qualifying designated actions through their online social profiles are eligible to earn Marriott Rewards points through #MRpoints. 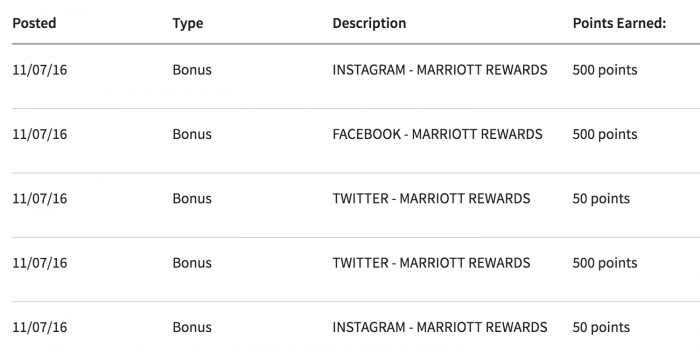 A maximum of 2,500 points per Marriott Rewards account can be earned each calendar year through #MRpoints,” so you will be able to earn more through these social connections down the line. As a further bonus, you will get an additional 50 points for then following each of Marriott’s Twitter & Instagram profiles, bringing your total free points haul to 1,600 points. When I signed up, I did not have the option to get 50 points for following Marriott Rewards on Facebook, but it’s possible that I was not offered this since I already follow them there. To ensure that you get the max free points, you may want to unfollow all of their accounts first. The confirmation e-mail I got said that I earned 25 points, not 50 for following Marriott on Twitter & Instagram, but it posted as 50. The promotion is part of Marriott’s 30 Days of Members Get It promotion, so there are other offers available as well. It looks like there will be new promos each week, so be sure to keep checking back for the next month. You have until December 7, 2016 to earn your free 1,500 Marriott Rewards points (or more) for connecting your social accounts.